Last month I got the pieces for the "Forbidden Palace" quilt cut out and assembled the first block. I was worried it was going to take me forever to get the little rectangle "snowball" blocks pressed - and we won't even talk about how pulling the little black corners back with my fingers left me vulnerable to getting my fingers singed! I needn't have worried - because once I started pressing, I realized that I could move very fast indeed and needn't expose my fingertips. All I had to do was lay out the blocks in a row on my ironing board. 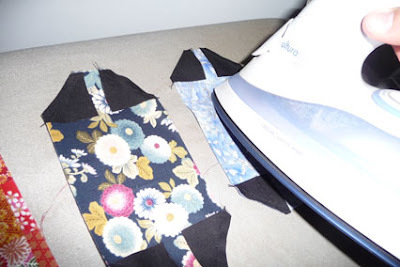 Then, with the iron heated, I pressed the top of the iron firmly into the fabric just below the little black wedges that I wanted to flip and press. Pressing down firmly, the iron's edge caught the black corners and VOILA! The corners on top flipped up beautifully and it only took half a second! So all I had to do was flip the "top" of each block, then quickly turn them upside down and repeat the process on the bottoms. Bang! Those blockes were pressed and ready in less than 40 minutes. Now for the task of deciding which blocks will sit next to which blocks. The quilt has 16 columns (across) and 10 rows (down). I carefully selected the blocks for the first row... really took my time. Satisfied, I did row 2, again going slowly and carefully considering each one. It took about half an hour to get that far. Let's do the math... 30 minutes for 2 rows, need to do 8 more rows. There were maybe half a dozen blocks that, when randomly tossed in, landed next to something that really CLASHED - but for the most part, just tossing the blocks randomly worked out just fine. Now for the trickiest bit of all: picking up the pieces and keeping them in order as I'm stitching. Not only that... but many of the prints were "one way" designs with a definite top and bottom. 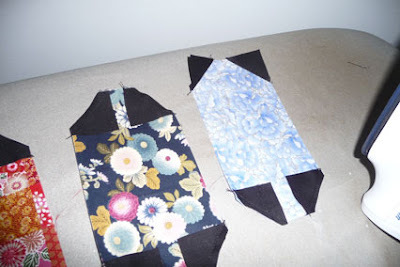 I had to be sure that I didn't inadvertently flip one of those blocks and sew it on upside down. But I came up with a method to keep me straight. I began by stacking up the blocks from the bottom row - with the rightmost block on the top. As long as I worked down thru the stack in order, I was able to get the blocks assembled into a strip. I did the same thing with the row second from the bottom - but on that one I put 2 safety pins near the bottom. This helped not only to identify the which end was "down".. but helped me to keep straight which strip was the bottom and which was 2nd from the bottom. When both strips were done, I stitched them together, careful to mind where the pins were. 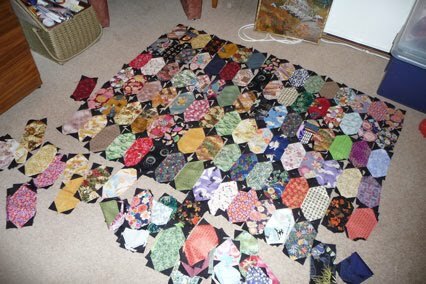 Then I went to the next 2 rows (heading up the quilt) and used the same approach. Fiddly? Yeah... but the top is assembled now and all the blocks are in the same order that I laid them on the floor. 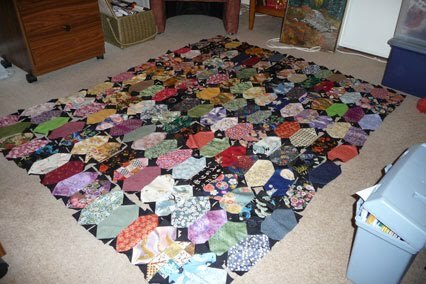 My good friend Julie is fond of quilts and last year I was happy to surprise her with the "throw" sized "Faded Memories" quilt - a kit from "Patchwork With Gail B." We'd agreed before then that at some stage I'd make her a queen size quilt for her bed, so long as we could find a design she liked and was within my rather limited range of ability. We had lunch a while back and I took along the newly pieces top for the "Forbidden Palace" quilt - a quilt made up of Japanese prints (Quilt 10). Julie is mad for Japanese prints, so naturally she went wild for it. She doesn't really want another throw size - but felt that if this kit could be expanded to make a queen spread, she'd really love to have it. So out comes my Quilt Wizard software. First I "built" a quilt the same dimensions as my throw-sized project, but added 3 rows and 3 columns to extend it so that the "stained glass" panels would cover the entire top of a queen bed. 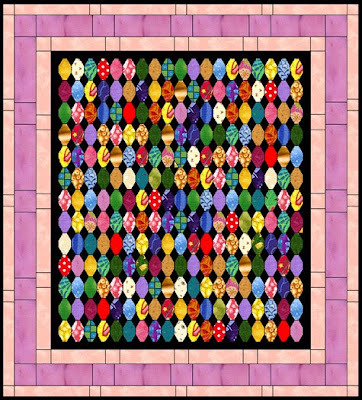 Then I added borders (Julie is fond of pinks/mauves, hence the colour choice below). Not half bad! I figured we could get another kit from the shop and I could pick up fat quarters to extend the fabric. The pink/mauve border is a bit overwelming - and so we were looking at using more neutral colours. Unfortunately we've had to shelve the project, as the funds that might have gone into the materials were badly needed elsewhere. Oh, well.... maybe next year? I started out buying the fabric for my first quilt at Spotlight (giant chain store selling housewares, linens, craft supplies and fabric). I was happy enough with the fabric that I bought. For the most part it wasn't terribly expensive and for my first project, well, paying $12-14 per meter for most of the fabric certainly seemed more sensible than diving in at the $22-26 per meter end of the pool. I did have one very unhappy experience there, however. I'd bought some cheap red cotton at $5.99 a meter. Prewashed that with the white-and-black prints that went into Quilt 1 and had no trouble. But then I decided that I wanted that same inexpensive red for the backing fabric. Thank heavens I also bought half a meter of the white-and-black. I prewashed this second lot of cheap red and threw the half meter of white-and-black in with it. Well... the white and black came out of the wash PINK and black! And I was seeing red for sure. The gals at Spotlight - up against company policy - could not do much. I was livid. In the end a manager agreed to replace the half meter of white-and-black, but I was stuck with umpteen meters of bleeding red that continued to bleed after a 2nd and 3rd wash (can you say "Bleedin' USELESS FABRIC"?). It was an eye opener. I've been sewing for over 40 years and never had a "washable" fabric bought at a fabric store bleed like that. NEVER. And I was disillusioned about 'cheap fabric' at that point - you can bet that "prewash with something white thrown in" will be standard practice from here out. For project 2, Spotlight just didn't have the colours I wanted, so I went to "Foothills Fabric and Threads" - a small quilting shop not far from my home. I was delighted there with the selection of fabric, the quality, and the truly lovely ladies who own and staff the shop. I do not recall the name of the woman (one of the owners) who helped me that day - but I can tell you I've rarely had such a charming "retail experience." She was supportive, helped pick out the fabric (she's got a fantastic eye for colour and pattern, almost as good as friend Pauline), and gave me just the right mix of encouragement and advice. By the time I left the shop I felt more like I'd spent an hour or so with a good friend than like I'd been shopping with a stranger. Everytime I go in that shop I have the same experience. Even when there are other customers in the store they make me feel so welcome and so important. Their store became my favorite. Later on in my adventures, friend Pauline (the same one mentioned above) introduced me to "Patchwork With Gail B" - a quilting superstore. One look at the thousands on thousands of bolts to choose from (and fat quarter table bigger than my kitchen) and well, "...Gail B" became my favorite. Well.. hm... I've gotten "sophisticated." If I want cheap backing fabric - Spotlight. And they do have a few very pretty prints. As long as I'm wanting to keep costs down and am willing to risk the possibility of "bleedin red" again - they do just fine. "...Gail B" wins the prize for variety. Holy cow - you could go nuts in a place like that... so MANY fabrics! But if you want something in particular, it's the place where you're going to find it. And they have a nice selection of "oriental" prints, too - which you don't find in abundance at the other two stores. Their staff is lovely, too - helpful if you ask questions and certainly knowledgeable. But "Foothills Fabric and Threads", well... I love that store. Was there today and "Sandra" waited on me. And you know what?!?! She REMEMBERED ME! How charming is that?!? OK... my American accent is a giveaway - but still. It's sweet to do business with a small business owner who actually remembers who you are. And so that shop has a real grip on my loyalty as a customer. And - because of how lovely Sandra was today... I'm probably never going to buy batting anywhere else. Today is a very important day in my life. Today I will become an Australian citizen. I will retain my American citizenship; both countries permit dual citizenship. My decision to become an Australian citizen has nothing to do with my feelings about the United States. My feelings about the country of my birth are not diminished. 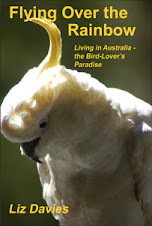 I am doing this because I love Australia and her people. Australia is my home now - and becoming a citizen solidifies and legalizes the commitment that I feel to this country. It is an important step, a deeply emotional one. It is a step that fills me at once with strong feelings of pride, belonging, and community.